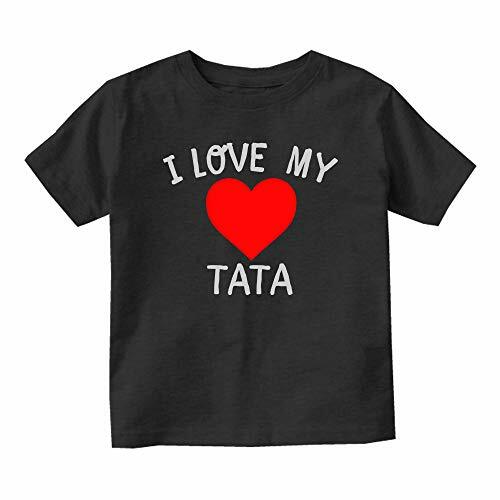 I Love My Tata Baby Toddler T-Shirt Tee by Kids Streetwear. Our infant and toddler tees are perfect for both baby boys and girls and are made of 100% soft cotton and grey is 93% cotton, 7% polyester. We only use the best quality products with double-needle hem sleeves, topstitched ribbed collar and a reinforced three-snap closure. This makes it perfect for your baby or as a baby shower gift! We print and ship all our products from the USA! All our Graphics are created and printed in house by Kids Streetwear! Made of 100% Cotton with Double-needle hem sleeves, Topstitched ribbed collar. Graphic print has a soft feel for the most comfort for your little boy or girl. If you have any questions about this product by Kids Streetwear, contact us by completing and submitting the form below. If you are looking for a specif part number, please include it with your message.